Constraint programming is a powerful paradigm for solving combinatorial search problems that draws on a wide range of techniques from artificial intelligence, computer science, databases, programming languages, and operations research. Constraint programming is currently applied with success to many domains, such as scheduling, planning, vehicle routing, configuration, networks, and bioinformatics. The aim of this handbook is to capture the full breadth and depth of the constraint programming field and to be encyclopedic in its scope and coverage. While there are several excellent books on constraint programming, such books necessarily focus on the main notions and techniques and cannot cover also extensions, applications, and languages. The handbook gives a reasonably complete coverage of all these lines of work, based on constraint programming, so that a reader can have a rather precise idea of the whole field and its potential. Of course each line of work is dealt with in a survey-like style, where some details may be neglected in favor of coverage. However, the extensive bibliography of each chapter will help the interested readers to find suitable sources for the missing details. Each chapter of the handbook is intended to be a self-contained survey of a topic, and is written by one or more authors who are leading researchers in the area. The intended audience of the handbook is researchers, graduate students, higher-year undergraduates and practitioners who wish to learn about the state-of-the-art in constraint programming. No prior knowledge about the field is necessary to be able to read the chapters and gather useful knowledge. 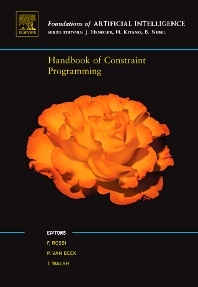 Researchers from other fields should find in this handbook an effective way to learn about constraint programming and to possibly use some of the constraint programming concepts and techniques in their work, thus providing a means for a fruitful cross-fertilization among different research areas. The handbook is organized in two parts. The first part covers the basic foundations of constraint programming, including the history, the notion of constraint propagation, basic search methods, global constraints, tractability and computational complexity, and important issues in modeling a problem as a constraint problem. The second part covers constraint languages and solver, several useful extensions to the basic framework (such as interval constraints, structured domains, and distributed CSPs), and successful application areas for constraint programming.